Bonjour mes belles! Today, I'm excited and I think you know why. Yup, I've made another beauty discovery and I'm stoked to share it here with all of you. If you love shimmery glitter nail polishes, then this post if for you! A few days ago, I received an enormous shipment from Cindy Shimmer, the creator of Shimmer Polish, and was immediately impressed by the complicated color combos of the glitter mixtures. As a glitter polish enthusiast, I find that complex mixtures are quite rare in mass produced polishes and the fact that all Shimmer Polishes were well-mixed really intrigued me. I went on to swatch every color I received and was absolutely blown away by the high density and pigmentation of these beautifully crafted lacquers. Check them out! Furthermore, I found it so endearing that Cindy has named her polish collection after her friends and family -- I then decided to grab Irene (my mom) and then Sarah (LeeLee's mom) to create my first ever Shimmer Polish Nail Art! 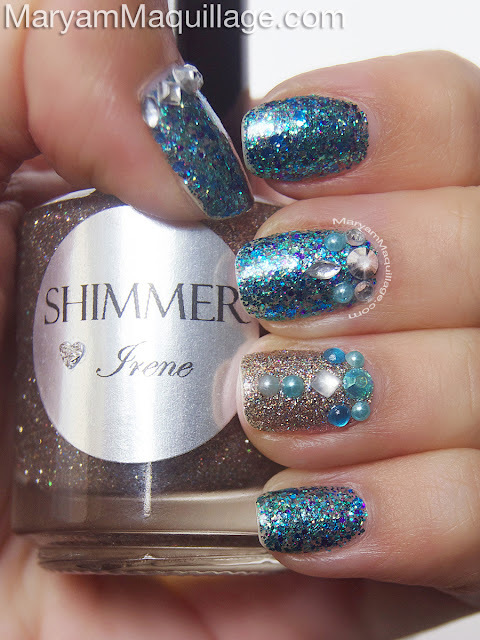 Shimmer Irene (Champagne Silver) -- the glitter in this polish is finely milled and super dense. Irene is a silver glitter polish that flashes an array of teal, gold, orange, green and purple sparkles. Shimmer Sarah (Tropical Green & Blue) -- another densely packed polish with small, medium and chunky sized glitters in aqua, teal, purple, gold, green and pink. All Shimmer Polishes can be purchased through the Shimmer Polish Etsy Store or by contacting Cindy directly at her email. Each polish is $12; custom polish is $15. For my first Shimmer Nail Art, I wanted to showcase the true potency of the polishes, while maintaining the integrity of the colors, so I applied 2 coats, directly on top of my clear base coat. Besides, with glitter so dense, these polishes don't even need a base color! Can you believe the pigmentation?! i love it! especially the lip colour! I love it! I love all what have glitters ;o)... Xoxo V.V. the glitter itself in this nail polish is really outstanding, i luv it ! This is a fabulous LOOK and the color says it all!